Research In Motion has a new name, a new operating system and a pair of new handsets, but it’s still got the same old sinking stock price. On Thursday, shares of the smartphone pioneer continued the downward slide they began the day before, during the unveiling of its long-awaited BlackBerry 10 OS and handsets. BlackBerry shares opened down 10 percent and, at $13.21, they’re down nearly 4 percent as I write this. Why the pessimism after what seemed to be a fairly successful launch event? 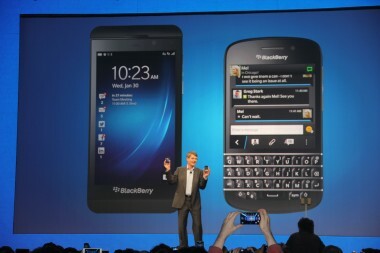 The estimated arrival dates of the first of BlackBerry’s BB10 phones. Though the touchscreen Z10 debuted in the U.K. and will ship in Canada and the United Arab Emirates next week, it won’t hit the U.S. market until March. And the Q10, a BB10 handset with a physical keyboard, won’t be available anywhere until April. Later-than-expected ship dates imply smaller-than-hoped-for unit shipments, and the Street clearly finds that disappointing. Beyond that, there are concerns about the BlackBerry ecosystem and addressable market that I mentioned earlier this morning. That said, BB10 is a vast improvement over its predecessor, and has certainly closed the gap with Apple’s iOS and Google’s Android. It’s not hard to imagine it appealing to BlackBerry diehards looking for a next-generation device. But the legacy user base is an easy mark. Those BlackBerry users who have defected to iOS and Android over the last few years will be a far harder sell.